These insulated little “igloos” retain body heat, keeping it 60 degrees warmer inside than outside on cold nights, without electricity! 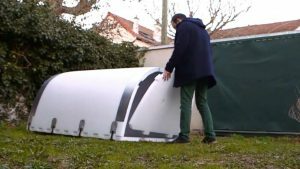 A French engineer has invented inexpensive, waterproof, heat-retaining shelters for the homeless. After living in Montenegro for a year, where there was hardly any homelessness, Geoffroy de Reynal was disturbed by the number of people he saw sleeping on the streets in the cold when he came back to France. 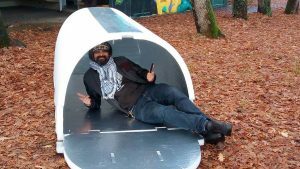 So he decided to put his engineering degree to work and come up with a simple, but brilliant solution — little igloos, the size of a one-man tent, but much warmer. The walls are made from polyethylene foam and wrapped in aluminum foil, inexpensive materials that together are capable of retaining body and keeping the shelters about 60 degrees Fahrenheit warmer inside than out. 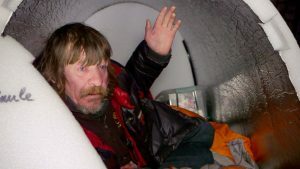 “I sometimes have to sleep without my jacket because it is so warm in here,” Christian, 58, tells ABC News, while drinking a beer and listening to a soccer match on his radio. They’re also waterproof, helping the homeless stay dry as well as warm. 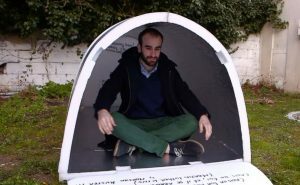 They also offer more of a sense of privacy and security than many homeless shelters offer. After coming up with the design, De Reynal raised over $20,000 with a crowdfunding campaign, which he used to build 20 igloo prototypes. He distributed them to 10 lucky homeless people in Bordeaux and 10 in Paris last winter. 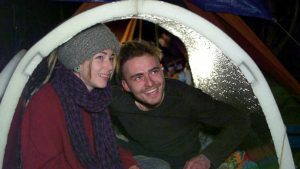 “We have much better nights inside the igloo shelter,” Oceane and Benjamin, both 21, tell ABC News. He hopes to convince the French government to help him finance the project. There were about 140,000 homeless people living in France in 2012, a 50 percent increase since 2001. There are half a million homeless people in the United States.